This is the area for manual Dissolution Tablet Testing Instruments. Basically you can select from 3 versions while all of them are ready to be upgraded to a semi or fully automated system, they are in full compliance to the valid USP<711/724>, EP<2.9.3/4> and many International Pharma-copoeias. 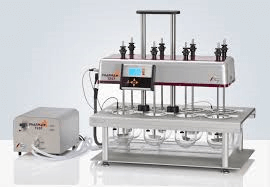 We supply Semi Automated systems as well as fully Automated Dissolution solution packages using these manual dissolution testers on this page. The latest invention is the IDS-1000 In-Situ Fiber Probe system. As the new DTS-800 its world-wide a unique design because all equipment needed to perform an automated dissolution test is “on board”. The PTWS 820D is an 8-position, single-drive compact tablet dissolution testing instrument. It features a completely new set of control electronics with a large color touch screen. These controls the various mechanical features of the instrument such as the tool stirring speed, lift drive, and heater. The instrument control is menu-driven. Visual signals inform the operator of the status of the critical instrument parameters, e.g., the current bath temperature and a countdown timer for the next sampling interval. Once a test is running, the instrument switches into a “highlight” mode, displaying critical information in an enlarged font. The touch screen uses resistive technology (pressure sensitive); therefore, it is easy to be used even when wearing laboratory gloves. User data is stored on an SD card and can be copied to a computer for backup or transferred to another instrument. This way the storage space for the methods is basically unlimited. It is also possible to perform a quick test directly from the start screen. This is without the need of creating any methods or logging on to the instrument beforehand (this function can be disabled). The new EPE autosampling manifold of the PTWS 820D with an encased design removes all tubing lines from the working area reducing also failures. The EPE is automatically driven into the programmed sampling position at the interval times, these are stored in memory. The probes remain in the dissolution medium only during the sampling times. The individual temperature probes are part of this. The new sampling probe design combines the sampling and backflush probes into 1 probe with an inner and an outer tube. It is also reducing the number of holes required in the tablet magazine to help prevent evaporation. The optional media replacement is done through a second tube. The redesigned TM tablet magazine features integrated convex vessel covers. The convex shape causes condensed medium to drop back into the dissolution vessel. The integrated covers seal the vessel thereby reducing any evaporation significantly. Circulation : Water circulated from external heating system through special diffuser inside the water bath. 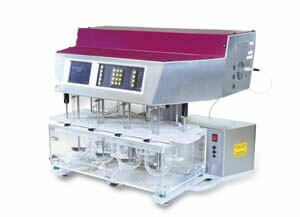 The PT-DT70 is the low head, manual flip back dissolution tester from Pharma Test. It provides a space saving, low cost entry into dissolution testing. Whether for a new laboratory or to meet tough budget requirements, the PT-DT70 offers a lot of instrument for a comparatively modest cost. This instrument offers seven stirred positions as well as a pneumatically supported lift off top for easy access to the dissolution vessels. The test vessels are placed in 2 lines (4+3) and it is easy to remove spent samples and refill with solvent by lifting up the drive housing. To insert samples and withdraw solution 7 holes and guiding tubes are placed inside the top cover of the instrument. Simply place your tablets next to the holes and introduce when ready for test start. For easy sampling use the PT-MDS Manual Sampling System which includes sampling tube – inline filter and a 10 ml. disposable syringe. Program sampling sequences and get informed by a Beeper for action. Also the PT-DT70 is already equipped with all necessary interfaces to connect a sampling system for test automation. Interface for installation of a DATA-LOGGER PT-DL1 is built-in. 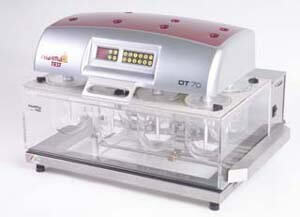 The PT-DT70 is in full compliance with the relevant USP<711/724>, EP<2.9.3/4> and Japanese Pharmacopoeia. Other instruments of the Pharma Test dissolution instrument series are the PTWS100, PTWS 310 for 1 and 2 litre vessels, PTWS 610 (6+2), PTWS 1210 (12 + 2) and the PTWSD610 (2 x 6 + 2) and the 5 ltr. vessel instrument PTWS 4000. The PTWS 800D Manual Dissolution testing instrument is an 8 position, single drive compact tablet dissolution testing instrument for solid dosage forms as described in USP chapter <711/724> and EP section <2.9.3/4> as well as the DAB and Japanese Pharmacopeia section . It is supplied with a staggered start feature for each of the eight positions. The upper drive is electronically controlled to offer two positions: an upper cleaning and a lower working position. The electronically driven lift mechanism is located centrally above the water bath. This assures that the whole lift drive mechanism is positioned in a way so that the tool shafts are always kept parallel and at a 90° angle to the vessel walls when in the working position. The PTWS 800D manual dissolution testing instrument features the 3CS three-point individual centering system for each dissolution vessel. The vessels are held in position by three adjustable noses and are inserted into the instrument support framework. The access points for sampling as well as the openings for the tools are contained in an auxiliary, low evaporation, vessel cover. The blow moulded water bath can easily be removed from the support frame for cleaning purposes. The bath cover can also be easily unscrewed for cleaning. The water bath contains a water diffuser for faster heating and to ensure that heated water is evenly distributed throughout the whole bath. The heating system is contained in a separate stainless steel housing. The connections between the heater and the bath are made by „quick connect“ fittings for easy connection and disconnection. Water is pumped through the system using a powerful, yet quiet, circulation pump. The pump itself is spring mounted (to limit vibration transmission) and the flow-through heater is protected from overloading (overheating in case of control electronics failure) via a thermal fuse as well as a thermo switch for added security. With service and maintenance in mind, access to the compact pump and heater section is easily achieved without having to move the main body of the instrument. 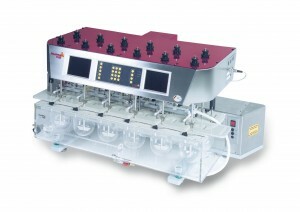 The PTWS 800D Manual dissolution tester uses the Pharma Test MonoShaft™ design. Tools consist of the main shaft plus interchangeable tool heads (adapters). The main shaft remains in place in the instrument regardless of the tool head being used. The clearance of each tool from the vessel base will always be correct once the main tool shaft has been installed and qualified with any one of the tool sets once. Each stirrer can be raised by hand into a convenient position for easy vessel removal or insertion. A key point in today’s crowded labs is the footprint of the PTWS 800D. The space saving design of the PTWS 800D offers the user the choice between a 2×4 or a 4×2 configuration with a minimal space requirement of just 45cm by 75cm (width by depth). In keeping with our cutting edge design, a touch screen allows control of the various mechanical features of the instrument such as the tool stirring speed, lift drive and heater. The instrument control is menu driven. Visual signals on the display inform the user of the status of critical instrument parameters, e.g. bath target temperature not reached. Access to the instrument can be password controlled if required. If certain operational parameters form a regular feature of the daily routine, then these can be incorporated into a test method for faster set up. These parameters can be tool speed, target bath temperature, sampling time points and so on. The test method memory capacity is almost limitless. As soon as the test is started, a screen saver can be activated with the most important information displayed in large script so that this information remains visible even at time when the operator is not standing directly in front of the instrument. For offline automation with fraction collection the PTFC-2 fraction collector as well as either a peristaltic or a piston pump can be added to the PTWS 800D. Using the PTWS 800D within an automated system offers the operator full access to the vessels before and at the end of a run as the complete drive head is lifted electronically. 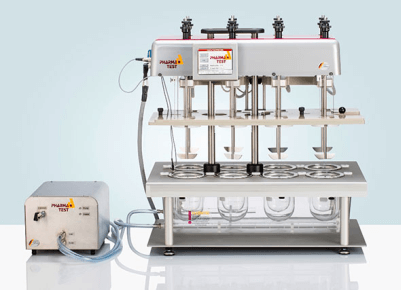 Sampling sequence timing, sampling volume and the optional media refilling process are programmed using the menu system of the PTWS 800D instrument. No external software is necessary in this system. In-situ sampling ferrules are placed into the PTWS 800D vessels through cover holes. Each ferrule holds a 5 or 10µ PP sinter filter. When the tablets have been dropped into the dissolution vessels the automated sampling process starts. If the refilling option is used media refilling will start automatically after a sample has been withdrawn. It is also possible to use the DSR-M dissolution sampling robot which features the capability of sample dilution and offers excellent sampling accuracy via the fully integration piston pump module. Like the PTFC-2, the DSR-M can be fully controlled by the PTWS 800D. For an online automated system it is possible to use a UV/VIS spectrophotometer with a multiple-cell-changer. The spectrophotometer and pump of such a system is controlled by the powerful WinDiss ARGUS dissolution software. WinDiss ARGUS features drivers for most commonly available UV/VIS spectrometer types, like Agilent 8453 Diode Array, or conventional UV/VIS monochromatic spectrophotometers (preferably double beam and scanning versions) such as the T70, Cecil CE and Perkin Elmer Lambda series as well as drivers for many popular types of pumps. The PTWS 800D can be used in stand-alone mode in these systems. Other instruments of the Pharma Test dissolution instrument series are the PT-DT70, PTWS 100D, PTWS 100S, PTWS 310 for 1 and 2 litre vessels, PTWS 610 (6+2), PTWS 1210 (12 + 2), PTWSD610 (dual drive 6+6), and the 5 ltr. vessel instrument type PTWS 4000. 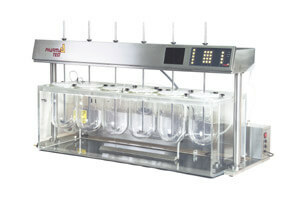 The PTWS 100 instrument design is a bench saving 6-spindle, lift-up, staggered stirrer start Dissolution Bath which offers 6 stirred positions, self-sealing and centring vessel covers, touch screen operation, audible signal for operator information, testing method filing system, and vibration free water bath assembly. 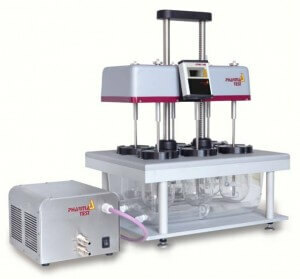 The PTWS100S and the PTWS100D are designed in complaince to the valid USP <711/724> and EP <2.9.3/4> Pharmacopoeia. This instrument may be used also for automation. The standard supply scope includes batch coded glass vessels (1 litre), coded mono stirrer shafts with attachable stainl. steel adapter with paddle blades (basket, TC etc. optional), stirrer depth and centring gauges. The 3by2 or 2by3 arrangement of the vessels reduces the footprint to approx. 45 cms. Using the PTWS100 within an automated system offers the operator full access to the vessels before and at the end of a run as the complete drive housing is lifted upwards electrically, assisted by the centre-drive head lifting assistance. Manual and automated sampling is done through vessel covers with special holes to allow the PT-MDS Manual Sampling System or any tubing installation to pass. The special design, in which the blow-moulded single piece water bath is placed to the instrument’s chassis and the separated heating system, virtually eliminates any vibration transfer from both within the instrument. Inside the Heating Box even the built-in circulation pump is spring loaded for absolute vibration free operation. For easy and fast maintenance the pump and mains power entry are placedinto a separate housing. Pump, Heater, Sensor, Mains Supply Board are accessible without to move the bath off its position. This saves you the necessity to do a USP Suitability Test using RS Tablets after instruments maintenance. Each stirrer shaft may be started to rotate inside the vessel after the tablets has been introduced either individually or common. The PTWS100D is supplied with a single DC motor drive while the PTWS100S includes individual stepper motors for each one of the 6 stirring stations. It is also available as a 2 litre version. Other instruments of the Pharma Test dissolution instrument series are the PT-DT70, PTWS 310 for 1 and 2 litre vessels, PTWS610 (6+2), PTWS1210 (12 + 2), PTWSD610 (dual drive 6+6), and the 5 ltr. vessel instrument type PTWS4000. .
TPTWS 310, Compact – complete – automated lift up: all-in-one design affords easy and safe handling for correct tool height and sampling positions – unique instrument design and handling. The user may enter a testing procedure description as a Method and file it. User access and operating level administration are standard for the PTWS series instruments. A 2 litre version PTWS 310-2 is available, too. All test vessels are placed in 4 + 4 rows and it is easy to remove spent samples and refill with solvent. The clear-view Plexiglas (Perspex) U-shaped water bath and the central drainage tap make sure that the bath can be cleaned any time should this be required. The solid design of the bath and the same clearance of the bath frame to any of the vessels inside it, ensures a perfect temperature distribution throughout. A built-in water diffuser distributes the heated media inside the bath. The bath itself rests on vibration absorbers. This avoids any vibration transfer from either inside the instrument or even from external equipment placed on the same bench surface. The PTWS 310 can be equipped with an EPE auto sampling manifold system which is automatically moving sampling tubes into the dissolution vessels and when finished out of them. It can also take the ITM External Temperature Probes to record the individual vessel temperature while sampling and a pH-probe to measure pH values before and after a test. The PTWS 310 is equipped as standard with a Manual Tablet Drop Magazine which inserts all samples at the same time whenever the test conditions are in the valid operational range (temperature / speed). The new Mono-Shaft design means you only change the stirrer inserts (adapter). The batch coded shafts are simply placed into the drive system, calibrated once and then remain there with no need for further adjustment. Other instruments of the Pharma Test dissolution instrument series are the PT-DT70, PTWS 100, PTWS 610 (6+2), PTWS 1210 (12+2), PTWSD610 (dual drive 6+6), and the 5 ltr. vessel instrument PTWS 4000. The PTWS 610 model is generally preferred if manual sampling is the chosen option. The six in line (plus two stirred extra vessels) format places all vessels in front of the user. Also the “staggered start” option for each stirrer is a user friendly design as it allows manual sampling without any timing problems. As with the PTWS 310, the instrument offers testing method filing, user access administration, auto positioning of the vessels inside the water bath. The U-shaped Plexiglas (perspex) water bath itself is decoupled so as to virtually eliminate any vibration from the drive and heater housing by integrated shock absorbers. A large LCD display, traffic light warning and alphanumeric keypad are also included as the user and access administration and a testing method filing system. The new Mono-Shaft design means you only change the stirrer inserts. The shafts are simply placed into the drive system, calibrated once and then remain there with no need for further adjustment. 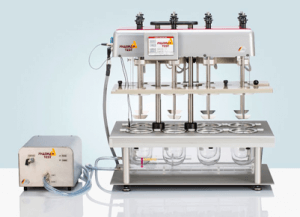 The PTWS 610 can be equipped with an EPE Auto Sampling Manifold system and a Manual Synchronous Tablet Drop Magazine which inserts all samples at the same time whenever the test conditions are in the valid operational range (temperature/speed). It can also be equipped with the ITM External Temperature Probes to record both bath and individual vessel temperature as well as a pH-probe to measure pH values before and after a test. All other specifications and technical features are more or less the same as for the PTWS 310. Other instruments in this series are the PTWS 310 with 1 and 2 litre vessels, the PTWS 1210, PTWSD610 (dual drive 6+6), and the PTWS 4000 instrument holding 6 of 5ltr. dissolution vessels. The PTWS 1210 is essentially a 12 position version of the PTWS 610 with 12 working positions plus two addition vessels for blank (medium) and standard storage. The user may edit a testing procedure and file it within the Method filing system. User and acess rights administration are standard. All 12 stations are controlled by the same electronics so the rotation speed of all tools for example is identical. This instrument has a full self check régime which constantly monitors all operational parameters such as bath position, water level and paddle position. The automatic centring system of the vessels inside the water bath ensures the correct positioning of the vessels with respect to the stirrer axis. 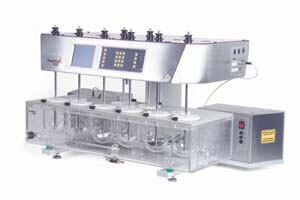 The system may be upgraded at any time to include an EPE Auto Sampling System which may be time programmed from the PTWS 1210 to drop down, take samples and raise itself once the samples are taken, an ITM Individual Temperature monitoring inside of the 12 dissolution vessels and a combined Tablet Drop Magazin and vessel cover. The Pharma Test TWS (trafic light warning system) monitors bath temperature, stirrer positions, bath position, pump flow rate, speed acuracy. This instruments contains an RS232 port, pH probe connection port, printer port, traffic light warning system, built-in OQ and PQ protocols (with warning display when OQ is due), pH input, LCD screen and many other features that you would expect from a state-of-the-art test instrument. Other instruments in this series are the PTWS 310 with 1 or 2 litre, the PTWS 610 with 6 vessels in one line + 2 extra ones, the PTWSD610 dual-drive 6 plus 6 vessels, and the PTWS 4000 with 6 off 5ltr. vessels. The PTWS D610, also know as the “dual stirrer drive apparatus” is a “two-in-one” version of the PTWS 1210 in that both the front and rear rows of stirring tools can operate on an independent basis. This means that for example, the rear row may be operating at one speed using baskets (say 100 rpm) and the front row can operate at another speed using paddles (say 50 rpm). This offers the ultimate in high throughput and application flexibility. In this version, there is one LC displays and one panel for tool rotation speed and so on, the user menu request the entry for the stirring speed of drive 1 and 2, program bath temperature for all samples, use optional Tablet Drop Magazine for all samples as well as optional EPE Auto Sampling System. Imagine the bench saving design of this system compared with two individual baths as well as the security to have all samples inside the same environment. The U-shaped water bath is placed onto Vibroban shock absorbers and the built-in heating system is assembled inside the easy access drawer. The system has 2 RS232 interface for remote control and data transfer. A built-in thermo printer records information of actual stirrer speed and the common bath temperature. Also a pH probe and temperature sensor connection is attached for inline reading inside the vessels. This instrument can also be programmed to start up automatically before the start of the day so that bath temperature and vessel medium temperature can be ready for use first thing. Similarly the instrument can be programmed to shut off the heater at night. Direct connection to a PTFC2 or DSR Fraction Collector is also possible for automatic timed sample removal. Each of the mono shaft stirrers can be withdrawn or started in a vessel at any time. This offers the possibility of a staggered start for manual and synchronous stirrer start for automated operation. Optional equipment may be added for automation like the EPE auto sampling probe system, the ITM media temperature monitoring device and a manual tablet drop magazine. Other instruments in this series are the PTW S310 (4+4), PTWS 610 (6+2), PTW S1210 (12 + 2) and the 5 ltr. vessel instrument PTWS 4000. The PTWS 4000 contains 6 off USP/EP glass vessels for a total volume of approximately 5 ltr. and 2 extra 1 litre vessels to take a Blank and/or a Reference Standard. It can also handle 1 and 2 ltr. USP/EP vessels using the same mono shaft stirring tools. The PTWS 4000 is an ideal instrument for either manual sampling or basic automation. 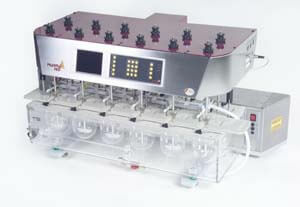 The “six-in-line” vessel configuration means easy access to the samples for subsequent analysis. Its automated lift-up system moves the drive head into an upper position to remove vessels, allow easy cleaning etc. The U-shaped water bath is separate from the main frame of the instrument and the built-in circulation pump is spring loaded assembled so the transfer of vibration is minimal. The system has a RS232 interface for remote control and data transfer to the PT-DL1 Data Logger to print information of actual stirrer speed and bath temperature. Also a pH probe and temperature sensor connection is attached for inline reading inside the vessels. This instrument can also be programmed to start up automatically before the start of the day so that bath temperature and vessel medium temperature can be ready for use first thing. Similarly the instrument can be programmed to shut off the heater at night. Direct connection to a Fraction Collector PTFC2 or other is also possible for automatic timed sample removal. The standard Testing Method Filing system eases the programming of sampling information. Each of the stirrer shafts can be withdrawn or started in a vessel at any time. This offers the possibility of a staggered start for manual and automated operation. The depth setting of the stirrers can easily be altered to meet the parameters of new tool setting, as is required for transdermal cylinders.